Make your trip to paradise as relaxing as possible with a shared transfer to your Maui hotel from the Maui International Airport. 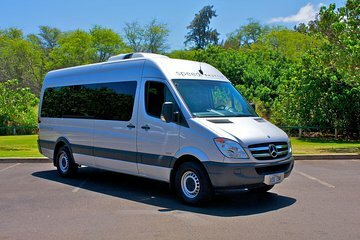 Maui locations available for the transfer are in Kihei/Wailea, Kaanapali/Lahaina, Kahana/Honokowai or Kapalua/Napili. A friendly driver will meet you at baggage claim and lead you to an air-conditioned shuttle, where you can sit back and travel to your accommodations comfortably. Upgrade to the lei option to be greeted with a ring of fresh island flowers around your neck. Please note that you must select a hotel that coincides with the areas listed in the Itinerary section below. Awesome adventure! Plenty of pit stops, stops at awesome spots on the way like views, falls...Glad I didn't drive, got to see the views! Met us at gate, smooth, no hassle travel to hotel. I used this airport shuttle service because it had worked so well in Oahu. But in Maui it was an expensive waste of time. One, this is supposed to give you help with luggage...that didnt happen. We had two carryon bags and when the guide met us he did not take either of our bags! We then schlepped thru the airport to baggage claim to wait on the van for twenty minutes! The cost for van was the same as a cab considering how much time we wasted waiting for our ride. They were right on time! We weren't crammed in like sardines. The driver was informative but not overly gabby. Got us to the airport without any issues. I booked this tour with a lei greeting and didnt receive it, we were on our honeymoon and something I wanted to surprise my husband with and when it didn't happen I got really upset, not only did we not have that we had to call the operator to find out where are transfer was as it did not turn up! Was as expected. The driver waited for us while we got our luggage and dropped us off at the hotel.